iBrain is an easy-to-use neuroimage processing and visualisation package. The software is free for non-commercial use. iBrain accommodates various requirements of neuroimaging analysis that can be difficult to achieve in other packages. iBrain is designed primarily to be utilised interactively from a graphical user interface, however some functions are also available via the command line. iBrain is now available for download here. More detailed information regarding iBrain can be found here. The iBrain Analysis Toolbox for SPM is an automated functional MRI analysis pipeline. The toolbox is compatible with SPM2, SPM5, SPM8 and SPM12. Version 3.0 of the toolbox was presented at the 17th Annual Meeting of the Organisation for Human Brain Mapping, Quebec City, June 2011. Abbott DF, Waites AB, Lillywhite LM, Jackson GD. 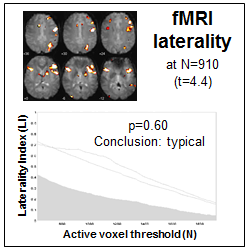 fMRI assessment of language lateralization: An objective approach. Neuroimage 50(4):1446-1455 (2010). All of the functions in this toolbox have now been incorporated into the more general iBrain Analysis Toolbox for SPM (see above).